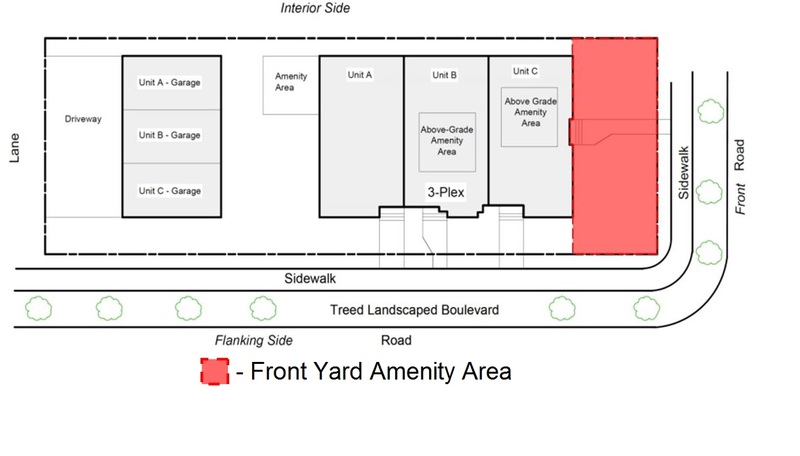 On March 14, 2016, City Council approved changes to the Zoning Bylaw regulations governing the development of row housing on corner lots in the RF3 Small Scale Infill Development Zone (Item 5.2) with the adoption of Bylaw 17556. The changes, which are part of Action 16 on the Infill Roadmap, help reduce the impact of row housing on neighbouring properties, and encourage row housing in RF3 zones that is sensitive and better integrates with the surrounding community. Row housing and other infill development is an important part of building a sustainable city. It helps create more diverse housing options in our mature areas, keeping these neighbourhoods as vibrant and sustainable as today. Amendments to Zoning Bylaw 12800 were approved by City Council and came into effect on March 14, 2016 (Item 5.2). An increase in the minimum interior side setback from 1.2 to 3.0 metres to allow additional area for at-grade amenity areas and enhanced landscaping. This helps provide better transition and screening between the row housing structure and the neighbouring properties. 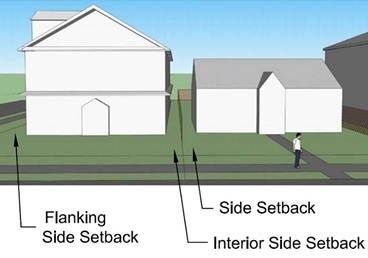 A reduction to the flanking side setback from 2.5 to 2.0 metres to create a more urban row housing form, while preserving sufficient yard space to accommodate landscaping and design elements such as verandas, porches and stairways. Allowing front yard amenity areas and replacing existing rigid dimensional requirements for private outdoor amenity area with a more flexible at grade amenity area requirement of 15 metres squared. This helps increase the opportunity for usable amenity area space, which adds to the livability and quality of life of residents. Requiring greater landscaping and exterior architectural treatments, such as unique facades and a minimum of one entrance door facing each public roadway. This helps create a pedestrian-friendly environment and reduce the appearance of massing from all vantage points. counteract the impact of a reduced building pocket created by the changes to the interior and flanking side setbacks. Requiring a step back when rooftop terraces are incorporated into the design of a structure to alleviate privacy and overlook concerns between neighbouring properties. Applying regulations specific to row housing on corner sites to apartment and stacked row housing to help manage common impacts on neighbouring properties. The City of Edmonton sought input from the community and development industry on the direction of the amendments through a number of channels, including targeted stakeholder meetings, an online survey and an interactive workshop. Feedback was used to develop the initial draft amendments presented to Executive Committee on December 7, 2015 (see item 3.3), and helped refine the revised amendments which were presented at the March 14, 2016 City Council Public Hearing. The changes approved by Council help reduce these impacts. Revised RF3 Row Housing Setback Amendments targeted to go to City Council Public Hearing on March 14, 2016. Draft Amendments presented to Executive Committee on December 7, 2015. Infill is important to building a sustainable city, and the City of Edmonton recognizes the need to support more and better residential infill.